Looking for deals in Salamanca? Eurostars Las Claras is in central Salamanca, just 7 minutes’ walk from the Cathedral and Plaza Mayor Square. It offers bright rooms with free Wi-Fi and a flat-screen TV. The location is good, well, the city is not big, but it's only a street away from a main street full of restaurants, and the restaurant right on the street corner is already excellent. There is enough space on the parking floor, though there's a charge, and a little complex to go in and get out. Featuring a spa, this 15th-Century palace has been beautifully restored into a luxury hotel. Bed/bathroom was very comfortable. Staff very attentive. Great sound-proofing in rooms. Rooms large by European standards. Beautifully appointed. Named Most Excellent European City Hotel by Condé Nast Johansens, this is a charming and quiet hotel in which you find spacious, perfectly designed and well equipped rooms. Quality of service was exceptional in all regards. I felt really at home there. One of the best hotel experiences I have ever had. Facilities at NH Salamanca Puerta de la Catedral include free WiFi throughout the hotel. It is in the heart of the old town, on the same square as Salamanca’s Cathedrals. Beautiful location next to cathedral and university. Heritage building, beautifully restored to nh Hotels high standards. Very comfortable breakfast room with awesome coffee and fresh to order choices. This elegant hotel is located in the heart of historic Salamanca, opposite the beautiful Convento de los Dominicos. It offers free Wi-Fi throughout. We last stayed in this hotel 20 years ago, we had stayed several times in the previous few years, so booked again when we returned to Salamanca this year. We weren't disappointed, the hotel was still very comfortable and had been upgraded since our last stay! All very modern and clean very large room and bathroom for a standard room, exceptionally comfortable bed. Location 5 min walk from Plaza Major in very quite location which is one of the reasons we chose to stay here as it's a little was out of the bustle of the town. Salamanca was just as lovely as we remembered and we hope to return again and will definitely stay at this hotel when we do. Hotel Residencia Castellano I is a small hotel 5 minutes’ walk from Plaza España Square and the Alamedilla Park, in central Salamanca. It offers a cafeteria and a 24-hour reception. Family run hotel with cafe/bar next door. Nicely homely decorated, very clean and quiet. Offering an outdoor pool, this cardio-protected hotel is located in Salamanca. Free WiFi access is available. Each room here will provide you with air conditioning. The font desk staff were very kind. We only stayed overnight on a two day road trip. Exe Salamanca is located in Salamanca, next to Jesuitas Park and 8 minutes’ walk from Plaza Mayor Square. It offers rooms with free WI-Fi, an LCD TV and private bathroom with hairdryer. First of all, the frontdesk girl was so kind and spoke fluent English. In the historic center of this city, Abba Fonseca is a contemporary-style hotel with an old stone façade, providing spacious and cheerful bedrooms. The program would not allow me above to rate the categories. This hotel is set in the center of Salamanca, making it ideal for visiting the many monuments of this ancient university city. Convenient spot in town, 10 min walk from historical center. This hotel is located on Salamanca’s famous Plaza Mayor, 5 minutes’ walk from the cathedral. It offers free bicycle rental and rooms with free WiFi. Some have a hydro-massage shower. Great location on the plaza. Nice room! Ibis Salamanca is next to Salamanca’s Los Jesuitas Park, less than half a mile from Plaza Mayor and the historic center of the city. It provides air-conditioned rooms with satellite TV. Park over the road very convenient for dog walking and close to restaurants cafes and bars. Hotel Alda Plaza Mayor is set in the historic center of Salamanca, yards from the Plaza Mayor. Everything. Ignore reviewers who moan about the lack of parking. In central Salamanca, the Hotel Rua is next to the Plaza Mayor and Casa de Conchas. It has bright, modern rooms with free Wi-Fi and flat-screen satellite TVs. I am always impressed with the hotels in Europe. Offering free WiFi and free parking, the modern Tryp Salamanca Montalvo Hotel is located by Via de la Plata, just 5 minutes' drive from central Salamanca. A bus stop is located 164 feet away. Didnt have breakfast. Had to Leave at 3am, to travel on. Located in Salamanca’s Old Quarter, Hotel San Polo is built around the ruins of the Romanic San Polo Church. 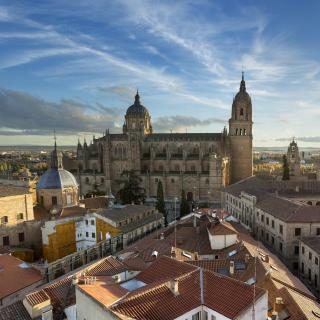 The hotel offers fantastic panoramic views of Salamanca Cathedral, just 492 feet away. Friendly welcome and quick check-in. Spacious, comfortable room and proper bathroom (with bathtub). Enjoy amazing views over the ancient, monumental city from the hillside setting of this modern hotel, located on the left bank of the River Tormes. Amazing breakfast. Incredible views of the city. Catalonia Plaza Mayor Salamanca is ideally located next to the Plaza Mayor, and offers free Wi-Fi. A very modern hotel ,50 meters from Plaza Mayor, the best location in Salamanca. Hostal Salamanca Home is located in Salamanca, 1.1 miles from Plaza Mayor Salamanca. This 1-star hotel offers free WiFi. The hotel has a shared lounge. At the hotel, the rooms are equipped with a... The man at the reception is very kind and helpful with the touristic informations. Set in an impressive stone building, this hotel is located next to the Roman Bridge. It features bright and spacious interiors, decorated with classic décor. Very nice hotel, very clean, large room, comfortable linens. This hotel is located in the center of Salamanca, a 3-minute walk from the famous Plaza Mayor and the shopping district. There is a public parking available nearby. It had all the comforts of home, i really liked the stay at the hotel condal. How much is a hotel in Salamanca for tonight? On average, it costs $50 per night to book a 3-star hotel in Salamanca for tonight. You'll pay around $72 if you choose to stay in a 4-star hotel tonight, while a 5-star hotel in Salamanca will cost around $133, on average (based on Booking.com prices). How much does it cost to stay in a hotel in Salamanca? On average, 3-star hotels in Salamanca cost $69 per night, and 4-star hotels in Salamanca are $79 per night. 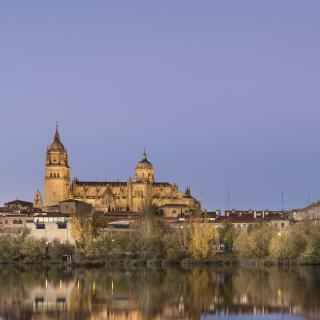 If you're looking for something really special, a 5-star hotel in Salamanca can be found for $142 per night, on average (based on Booking.com prices). What are the best hotels in Salamanca near Plaza Mayor Salamanca? Some of the best hotels in Salamanca near Plaza Mayor Salamanca include Salamanca Plaza Mayor, Salamanca Suite Studios and Las Catedrales. 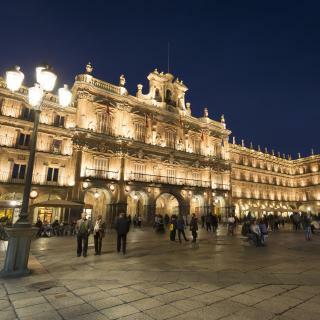 Which hotels in Salamanca are good for families? 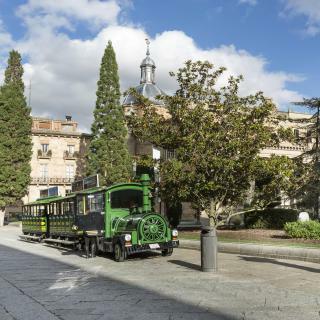 Many families visiting Salamanca loved staying at Hotel Rector, NH Collection Salamanca Palacio de Castellanos, and Hospes Palacio de San Esteban. Which hotels in Salamanca are good for couples? These hotels in Salamanca are highly rated by couples: Hotel Rector, Hospes Palacio de San Esteban, and Eurostars Las Claras. 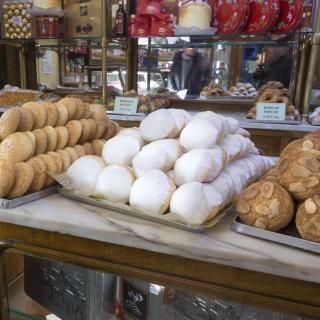 Which hotels in Salamanca offer an especially good breakfast? For hotels in Salamanca that serve highly-rated breakfasts, try Hotel Rector, Hospes Palacio de San Esteban, and NH Salamanca Puerta de la Catedral. Which hotels are the best ones to stay at in Salamanca? Hospes Palacio de San Esteban, Eurostars Las Claras, and Hotel Rector are some of the popular hotels in Salamanca. 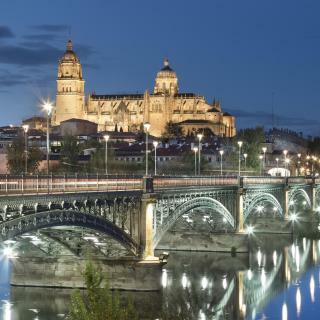 Which hotels in Salamanca have nice views? Hotel San Polo, Hospes Palacio de San Esteban, and Parador de Salamanca got great room view-related reviews from travelers in Salamanca. How much is a hotel in Salamanca for this weekend? The average price per night for a 3-star hotel in Salamanca this weekend is $175 or, for a 4-star hotel, $212. Looking for something even fancier? 5-star hotels in Salamanca for this weekend cost around $395 per night, on average (based on Booking.com prices). In the southwest corner of Castile and Leon, the Spanish city of Salamanca is home to one of the oldest universities in Europe. Declared a UNESCO World Heritage Site, the Old City is one of the most beautiful Renaissance cities in Europe. Right next to the Portuguese border, Salamanca has unique architecture including Romanesque, Gothic, Moorish, Renaissance and Baroque monuments. The Old Cathedral dates from the 12th-13th centuries and is joined together with the 16th-century New Cathedral. One of the most charming squares in Spain, Plaza Mayor is the heart of Salamanca and an excellent example of Baroque architecture. Take a stroll among the sidewalk cafes, cool off with some ice cream or relax in one of the picturesque restaurants. Founded by King Alfonso IX in 1218, the University of Salamanca has more than 3,500 international students and teachers. Known for its Spanish courses for non-native speakers, the university houses a huge library with more than 150,000 invaluable volumes. Booking.com has a great variety of hotels, guesthouses, hostels and apartments to choose from. Salamanca Airport is 9 miles away from the city and is easily accessible by public transportation. The nicest city in Spain. I find Salamanca to be a very good hideout from the chaos of larger cities when you just need to hide your head for a weekend. Reaching the city is easy by car from both Portugal and other parts of Spain, although traffic inside the city is very taxing. The new city is nothing special, but the Old Medieval City is lovely to walk around. You can find decent to great food in every corner, but it's not cheap. Getting around by foot is simple, the city is not that big, and the pavement is very friendly. The area by the river is very relaxing, the University is worth the visit, and so do the multiple palaces. Just beautiful, especially when the sun goes down. Just beautiful, especially when the sun goes down. The city is just big enough to walk around, with great places to eat. We have been here many times in the past on our way to and from southern Spain. We will be back at the end of the month! Love love love Salamanca ! Love love love Salamanca ! We come every year! Can’t get enough . This town is celebrating 800 years in 2018 ! So much history and culture. Plaza mayor , the town square is beautiful and lively. We hit the bars every night and ate small bites everywhere we saw a cool spot. They’re all amazing . Definitely a walking town ! I clocked 28,000 steps on my Fitbit so I could eat and drink 🍷 olé! Very easy town to get around and see the sights. Very easy town to get around and see the sights. The sandstone used in Plaza Major ant Cathedral was beautiful especially when the sun shined on them and at night. The combination of the old and new Cathedrals was very interesting and the sculptures on the doors were exceptional. Salamanca is a beautiful town with many historic landmarks. Salamanca is a beautiful town with many historic landmarks. The Universidad de Salamanca is celebrating 800 years of existence this year! We loved all the sights and found the city very manageable and easy to navigate. The Plaza Mayor is a wonderful starting point to the town of Salamanca. Lively both day and night. We found the people there very friendly and enjoyed that there are fewer tourists than some other cities in Spain. The New and Old Cathedral, Palacio de Monterey and the Universidad de Salamanca are all well worth seeing. This property offers great-value, clean and comfortable accommodation in an amazing location. The staff are very friendly and helpful and they spent a lot of time giving us recommendation for our time in Salamanca. And the views of the plaza are stunning. The hotel information is very upfront, so whilst the bathroom isn't the biggest and there are a few stairs, there were absolutely no surprises. This really added to a fantastic stay. Immaculate and terrific, private parking. Friendly staff provided up great directions all the sights in the little town which were free to enter on Sundays. 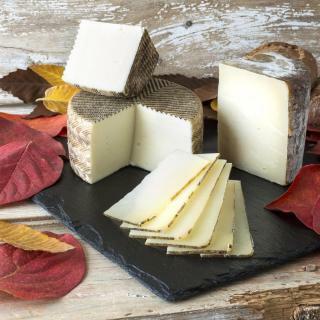 We heard this is common in Spain so check it out when you are somewhere on a Sunday. This was a comfortable stay for very reasonable cost to begin our Spain travel adventure. Excellent apartment, the best on our trip to Spain. Perfectly equipped for any need you can imagine. Great location, everything in old town is within minutes of walk. Ideal place for any stay, however long. Highest recommendations for everyone - and heartfelt thanks to the host. The hotel is small and relatively basic but the best thing about it is the staff who were always extremely attentive, communicative, polite and couldn’t do enough to make your stay as enjoyable as possible - Lovely stay and a fantastic location right in the centre of Salamanca! By far THE BEST hotel we’ve stayed in in Spain bar none. The attention to detail, tasteful decor, QUIET rooms, kind and attentive staff make this hotel a winner. My only regret was having to leave the hotel. The staff we talked to about the odor problem was great. They moved us to a bigger nicer room and were very nice about it. The location of the hotel was great, very central near everything. A good hotel close to the centre of Salamanca. The room and bed were very comfortable. The breakfast was very good. The staff were helpful and friendly. The bedroom is large and comfortable. The location is great! It was the best accommodation that we took in Spain. I strongly recommend. Brilliant location, comfortable stay. Real value for your money in one of the nicest cities in Spain. Friendly welcome and quick check-in. Spacious, comfortable room and proper bathroom (with bathtub). Great location within walking distance of old city centre. Reasonably priced. We can't wait to go again.